Vijzelstraat may not be a tourist-attracting street in itself, but runs down from the Munt Tower and the Flower Market towards Museumplein. A short walk away is Rembrandtplein, where restaurants and bars can be slightly over-priced for low quality food compared to other nearby locations, due to their ability to attract crowds. 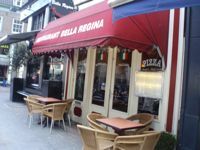 Bella Regina is an Italian restaurant a few doors down from the Pathe cinema. It looks small and unassuming, but they have a second floor upstairs should they become over-busy. It’s the type of place you could easily walk past without a second glance, never appearing fully booked, but the good location means it’s seldom empty. The décor is as you find in many Italian-themed venues, with pictures of Sophia Loren and Roman ruins, as opposed to promoting the more modern. The lighting is slightly dimmed and the whole place feels comfortable. There are always some Dutch diners, but the clientèle does tend to be a more international mix of tourists and some expats. Menus list the dishes in Italian, Dutch and English with the waiting staff also speaking all three. Starters are a selection of the usual Italian antipasta, from €3.50 for four slices of garlic bread or focaccia and other options including stuffed mushrooms at €6.75. Pasta mains start from €8.50 for spaghetti served with garlic and chilli and they serve an extensive range of pizzas. Meat and fish dishes range from €12.50 for chicken to €22.50 for a mixed grill. There are plenty of veggie options in the starter, pizza or pasta sections. We shared garlic bread which arrived quickly, followed by meat tortellini for €9.50 and mushroom risotto at €8.75. My fellow diner enjoyed her tortellini and when I have eaten here before the pizza and pasta dishes have always been very good. But although it was tasty, the rice in my risotto was too dry and therefore made the whole dish somewhat disappointing. Wine starts from €3.50 a glass, €9.00 for a half-litre or €16 per bottle, and we opted for a very drinkable half litre of house white. Soft drinks and Italian or Dutch beers are also available from €3.00 upwards. Paying in Dutch restaurants can be a frustrating process for non-natives, since in many other countries the staff can be keen for you to pay up and leave after finishing your meal. In The Netherlands, it often takes several attempts to persuade them to bring your bill and then even longer before they take your payment, especially if you have to wait for change or wish to pay my card. At Bella Regina however, the bill arrived after only one request and they did collect our money relatively quickly. The total came to €34 for garlic bread, two starters, a diet coke and the half litre of wine. The food is fairly unadventurous, but it does have flavour and offers good value for money, especially considering how close it is to Rembrandtplein. It does have the feel of somewhere benefitting more from passing trade than repeat visits, but this is a venue I have now visited several times and apart from the risotto on this occasion, have always been more than satisfied with my meal.